After listening to Unbelief's first outing, this writer quickly dug out his copy of At The Gates' Slaughter of the Soul and enjoyed a moment's perspective. The outcome: The 20 year old Slaughter of the Soul still smokes this newbie band's earnest attempt at melo-death. Tragic, but hey, that's the truth. 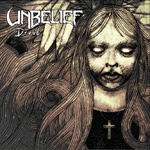 Unbelief's unbelievably bad first album does nothing for the genre it supposedly belongs to. Not that At The Gates are being compared to these guys; now this is unfair and unrealistic. But for perspective's sake, to see both sides of the coin, chart a particular genre's evolution, compare past and present, etc. The result is still epic fail for these Danes. Either Unbelief totally screwed themselves on different levels (it's okay guys, this is a first album, remember?) or melodic death metal circa 2010 is a dead horse. The ever enthusiastic listener will find all the usual energy and venom on such incinerating numbers as Code Red and the groove laden Hubris Will Follow, but how much The Haunted-meets-Bullet For My Valentine-meets-In Flames homage can the listener endure without going nuts? The riffs, be they aggressive, grooving, or chugging, are universally dull; alternating high and low pitched growls get tiresome after a few seconds; even worse, the album's mixing is bad. Considering how much damage they've already done to themselves, will Unbelief ever have a chance at making a name in the 'underground'? Unless they learn from their mistakes and write memorable and refreshing music, why, a definite YES right there. However, if they expect to peddle the same balderdash for the next couple of years until someone passes them the memo that says they blow, then it's zip. If you, dear reader, think this writer is excessively mean to these newcomers, rest assured it's done in the spirit of keeping you from stepping on doggie doo, or spending your cash on a subpar product. Seriously, check Unbelief's MySpace and listen to their muzak, then form your own opinion(s). It's best the abundant bad joo-joo Dread possesses be aired right now, rather than having a few hundred stark raving, pissed off, people hating the band after they bought it. It's best the abundant bad joo-joo Dread possesses be aired right now, rather than having a few hundred stark raving, pissed off, people hating the band after they bought it.